For years I had been an Asus guy. Their splashy, high end Motherboards such as the Maximus “ROG” and Sabertooth “TUF” boards, had the looks and features to garner my attention. Unfortunately, after some time. these specialty Motherboards started to come at a price. With rumors of many Asus boards now being built by ECS (and other ODM builders), plus the large number of high end motherboards being DOA, warranteed and/or refurbished, I had began to wonder if they were the right choice. 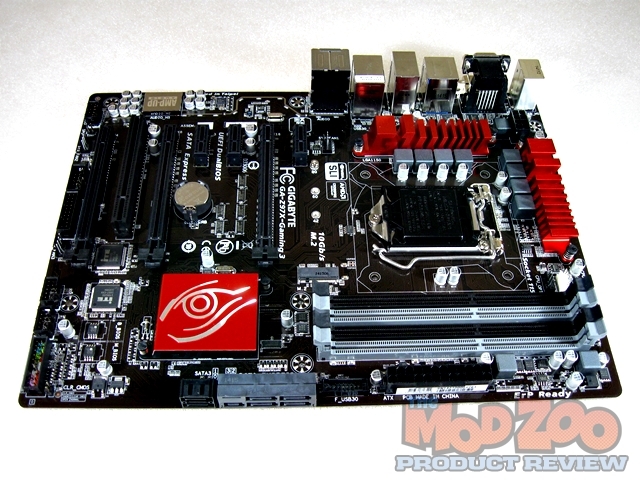 Well, a few years back, I reviewed the first of a series of Gigabyte Intel Z87 based motherboards, The Z87X-UD4H here on The Mod Zoo. Gigabyte was definitely heading towards the high end direction with these boards. I was very pleased with Gigabyte’s build quality, and feature rich Motherboards, that had the looks to match. This ultra durable series of Motherboards carried a model for every price point and every performance level. Plus the lack of DOA returns and refurbished boards in the market, definitly made me feel more secure! Now, fast forward to today. Gigabyte has spread their choices to a Dizzying, Three full series of motherboards. The “Ultra Durable Series” is designed to give you an unquestionably solid, problem free system. The “Overclocking Series” has improved stability, to squeeze every MHz out of your system possible. Finally, the “G1 Gaming Series” adds upgraded audio and killer networking, for your gaming enjoyment. For those of you keeping count. With Twelve (12) Ultra Durable, Three (3) Overclocking and Ten (10) G1 Gaming. That makes Twenty-Five (25) different Gigabyte Intel Z97 based motherboard offerings (not to mention “Black Editions”)! Doesn’t that make you head spin? Motherboard Features and Specifications from the Gigabyte Website. Nice thorough review, and I must say I quite like a lot about this board. But… WHY oh WHY are there so many non-standard sized motherboards out there recently… do not like. We call them “Standards” for a reason! For people who like little Mobos, The Gigabyte Z97MX-Gaming 5 has all the same features strapped to a mATX Mobo for the same money!! Excellent review, and Thank you Greg!